The Russound Smart Media Server is an intelligent audio source that plays music stored on its hard drive and Internet radio in three independent output streams. Through a multiroom audio system, it can play the same or different selections in different rooms at the same time. The Smart Media Server comes with either a 160 GB or a 250 GB hard drive. The SMS3 will hold up to 2650 hours of compressed music and the SMS3-250 will store up to 4140 hours for nearly endless enjoyment of your favorite music. You can load music from your CDs into the Media Server through a built-in CD-ROM reader or transfer music files from your computer. Using easy-to-navigate screens on your TV or computer, you can then organize the songs into themes by genre or artist for random playback or create playlists to play them back in any order you want. As you use the Media Server, its unique Personal Media Assistant learns your music preferences for each theme and applies those preferences to its automated song selection. 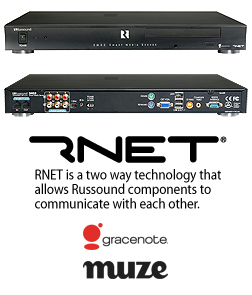 As an ideal music source for a Russound RNET® system, the Media Server can be controlled from the system’s UNO keypads or touchscreens, which display theme, artist, and song title information. It can also be controlled by IR remote control, from a computer, or through an RS- 232 serial port.